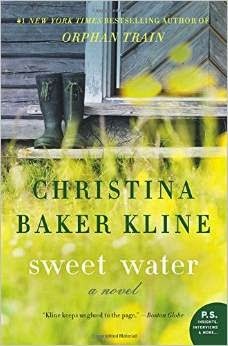 Sweet Water is the second book I've read by Christina Baker Kline. While the first one was completely different, I have found that I'm a fan of her writing, writing style and just her work in general. I've got another of her books lined up for reading pretty soon, and she may turn into one of my must-read authors before you know it. Usually it takes a few books before I decide, so I'll let you know for sure after the next one. Sweet Water: Novel, A (P.S.) was an enjoyable read. The character of Cassie is likable. She's motivated. She's human. As we get to know her she develops an independent streak that we, as onlookers, start to enjoy. Her newfound family? Not so much. There's mystery in Sweet Water. It surrounds Clyde (Cassie's grandmother who only goes by Clyde). It hangs over the family. The story flips back and forth. We get Cassie's perspective in the current day. We get Clyde's memories of years past. Situations. Friendships. A husband who has passed on. Cassie's grandfather. The reason she's here in this little town to begin with. There's unexpected connection between family members. I can't decide if that sentence is too literal or not literal enough, so I'll just leave it as is. You can download a Kindle copy of Sweet Water pretty easily, if you're looking for an end of the summer read, or headed off on a trip and want something non-stressful at your fingertips. The first book I read by Christina Baker Kline was Orphan Train. It's a must read. I haven't reviewed it yet because I'm not quite sure how to. I bought it on my own, which wouldn't stop me from reviewing it (I'd honestly like to get more of those reads reviewed here! ), but it's just a lot. Intense. Real. Just pick it up. You'll thank me. And stay tuned for a review of Desire Lines in the coming months. I really loved Orphan Train, and I'm looking forward to reading more of Kline's work. This one looks great. This sounds like my kind of book! I haven't read anything by her. I will definitely have to check her out! Thanks! I enjoyed Orphan Train, so I will have to look for this one. Thanks for the recommendation! This is a new author to me. And, I need something new to read.